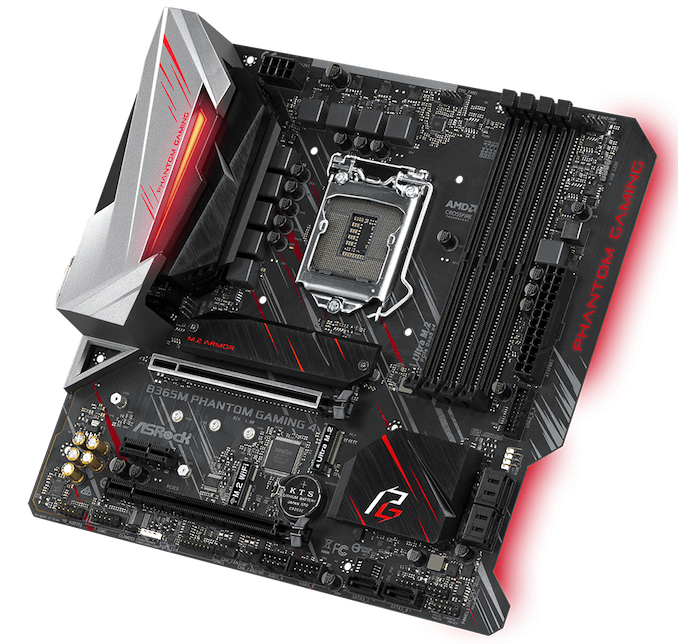 ASRock unveiled five new B365 motherboards at CES 2019 with a mixture of features similar to its Z390 offerings. The B365 Pro4 and B365M Pro are targeted towards professional users while B365 and B365M Phantom Gaming 4 mark a lower cost entry point onto the Intel 8th and 9th generation processors. The last of the five new models is the mini-ITX sized B365M-ITX/ac. In an effort to free up some capacity for the fabrication of their 14 nm silicon, Intel announced plans to add the B365 chipset to their line up last month which uses their 22 nm manufacturing process. 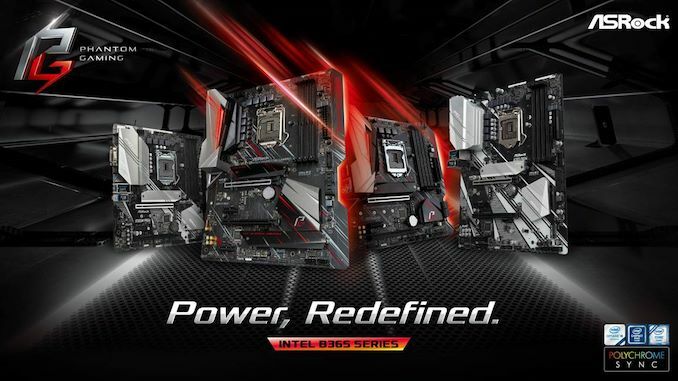 ASRock has taken this new chipset and marketed their new range with added the moniker of 'Power, Redefined', but the five new models look targeted more to general consumers. Each of the five ASRock B365 models uses a single 8-pin 12 V ATX power connector to provide power to the CPU (which is ample given the B365 doesn't officially support overclocking). 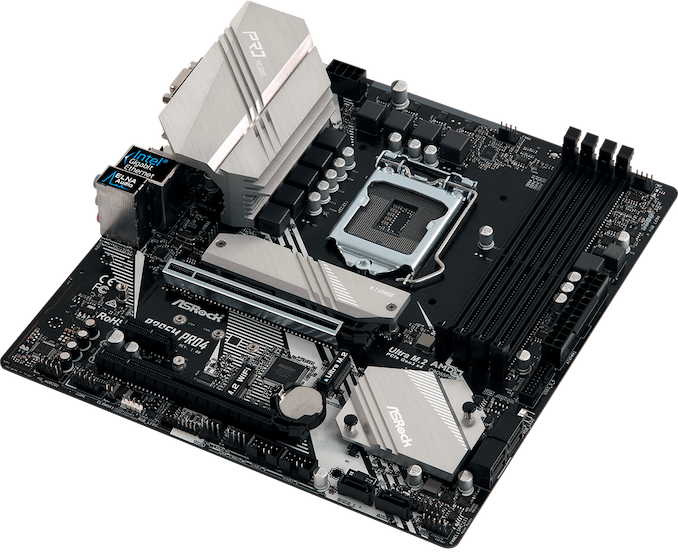 The B365 and B365M Pro4 models keep things basic visually, with no integrated RGB LEDs but instead offers users a more neutral-looking silver and black design throughout the heatsinks and PCB. Both the Pro4 models have four RAM slots with support for DDR4-2666 which will likely be higher when eventually released onto the market. The onboard audio is handled by a Realtek ALC892 HD audio codec, while the 1 Gb LAN port is controlled by an Intel I219V NIC. Storage capabilities consist of six SATA ports and dual M.2, even on the smaller B365M Pro4 micro-ATX sized model. Processors supported with integrated graphics can be used with HDMI 1.4, DVI-D and a D-Sub output. 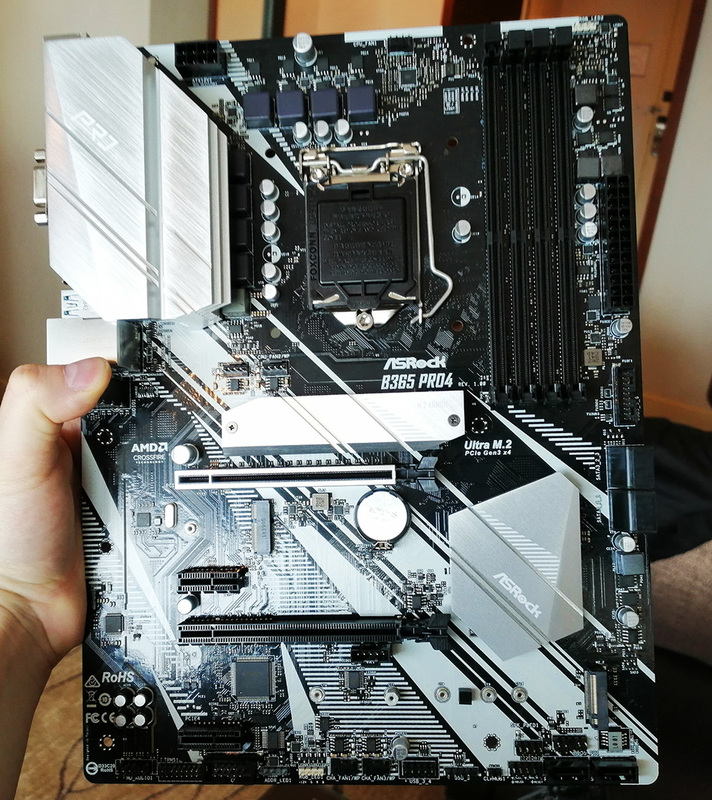 The design on the more gaming-centric B365 and B365M Phantom Gaming 4 models represent their new gaming range in the lower tier end of 8th and 9th generation chipsets, so these are likely to appeal to gamers on a budget. The general aesthetic of both the ATX and micro-ATX sized model is black and silver heatsinks, with black PCB and RGB LEDs integrated into the rear panel cover and right-hand edge of the boards. Like the B365/B365M Pro4 models, the new Phantom Gaming 4 models also share a similar controller set and PCIe layout. These include support for DDR4-2666 memory across four slots which is likely to be upgraded when the firmware and memory QVL lists are finalised. The audio controller of choice is the Realtek ALC1220 HD audio codec which has PCB isolate shielding included. Networking capability is provided by an Intel I1219V gigabit NIC and both models also share dual M.2 and six SATA ports. Compatible and supported processors with integrated graphics allow users to use either the HDMI 1.4 or DisplayPort 1.2 video outputs on the rear panel. 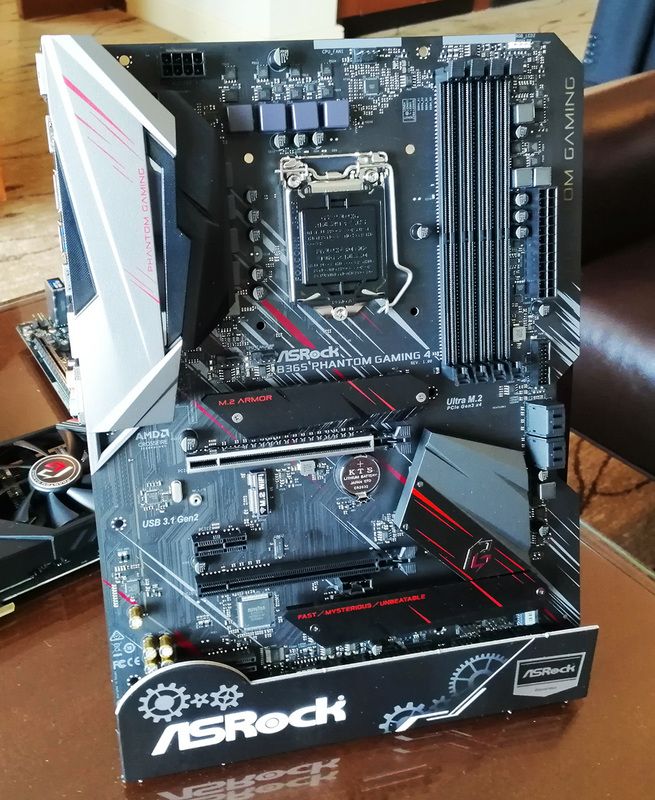 In recent times, ASRock has made some impressive looking mini-ITX motherboards across various segments including the Z390 Phantom Gaming-ITX/ac model which we are currently working on for review. 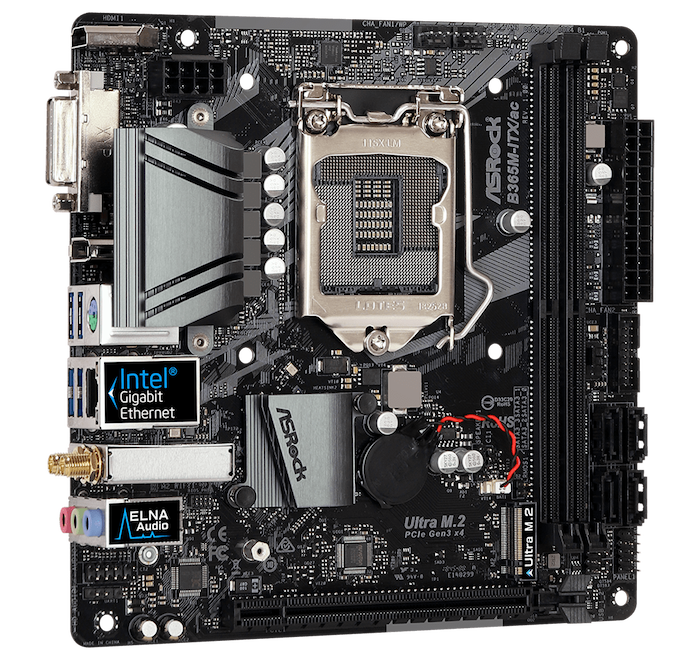 The B365M-ITX/ac looks to me a more bang for buck variation on the smaller form factor with the more budget Realtek ALC887 audio codec, but it does feature the same Intel I1219V 1 Gb LAN as the other ASRock B365 models. Unlike the other B365 models, ASRock has included an 802.11ac Wi-Fi adapter which also supports Bluetooth 4.2 devices. Storage options are slightly lesser than the other four models with just four SATA ports and a single M.2 slot available. It is worth noting that all the ASRock B365 product pages mention a maximum capacity for up to 128 GB of DDR4 memory, with the mini-ITX B365M-ITX/ac model offering up to 64 GB. This is a clear indication that all five of these models will support with the new Double Capacity DC 32 GB UDIMMs which G.Skill announced last year. ASRock hasn't announced when these new B365 models will be available or pricing information as of yet, but we expect this information soon. > "In an effort to free up some capacity for the fabrication of their 14 nm silicon, Intel announced plans to add the B365 chipset to their line up last month which uses their 22 nm manufacturing process"
"Pro" mobos without a DisplayPort output? What a "wise" decision!